Jenna Elizabeth Johnson: Cover Reveal and Excerpt from The Legend of Oescienne - The Ascending! Cover Reveal and Excerpt from The Legend of Oescienne - The Ascending! EBOOK AVAILABLE MAY 20TH, 2016! A year has passed since the Tanaan dragon Jaax and his human ward, Jahrra, came to live within the protected boundaries of Lidien, the great City of Light. But even the safest places in Ethöes can harbor enemies, and one cannot hide from one’s fate forever. At the onset of yet another departure, Jahrra realizes there is more to this next step in her journey than she previously thought. With Lidien fading in the distance, she understands she is finally leaving behind not just her friends, but also her childhood and a life once filled with dreams and illusions of safety and love. The road ahead is perilous, and Jahrra knows she will face many trials before coming to stand before her destiny. With each passing day, the threat of the Crimson King grows stronger, and Jaax and their allies will need the help of the legendary Creecemind dragons if they wish to overthrow their common enemy. Before they can present their case before the king of the Creecemind, however, Jahrra and her Tanaan guardian must make a perilous journey north through the mountains, where danger and uncertainty lurks in every crevasse and behind the face of everyone they meet. Their trust in others must be bartered carefully, for the Tyrant’s influence stretches far and wide. And even if they do reach Nimbronia, the frozen City in the Clouds, their troubles may not be over. 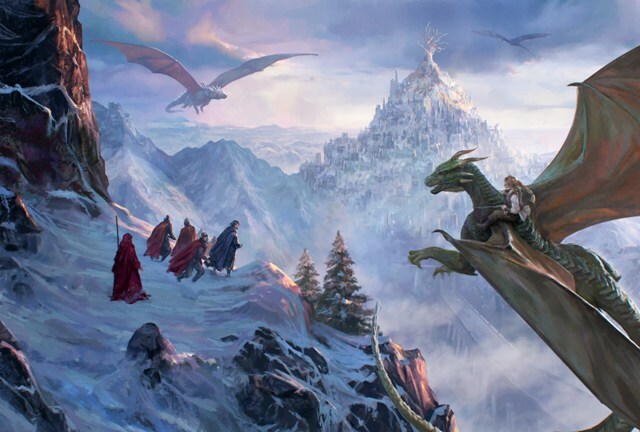 If the king of the ice dragons cannot be convinced to join their cause, then their fate, and the fate of Ethöes, may very well be sealed in sorrow and defeat. Sign up to start receiving the first six chapters (Prologue - Chapter 5) of The Legend of Oescienne - The Ascending, leading up to the release date on MAY 20th! Starting on Saturday, May 14th, you will receive a newsletter containing the Prologue for The Ascending. The next day you will receive Chapter One and so on and so forth until the release date on Friday, May 20th. Can't wait until May 14th for a snippet? Read the Prologue for The Legend of Oescienne - The Ascending now! Ebook and Paperback editions coming soon! It is said among the ancient ones in Ethoes that the trees know the goddess’ secrets. Toward the clouds their branches stretch, and into the depths of the earth their roots reach, so how can they not? They do, however, keep these secrets close, revealing them to no one, for Ethoes understands her creation would not be able to accept most truths. Despite their loyalty and silence, the secrets the trees keep do not always stay with them. Where the trees guard confidences, the wind shares them. Laughing, crying, singing. The wind does not know the meaning of silence. Rising from the seas, coursing down the valleys, rolling through the grassy plains, dancing over the dry deserts, climbing the mountain peaks. The winds of Ethoes comb through the boughs of oak, pine, beech and fir, tickling their thoughts from their leaves and branches, carrying them across the lands for anyone to hear, so long as they know how to interpret the trees’ language. However, the breath of the earth carries not only the secrets of Ethoes, but also bears the voices of those holding dominion over others. For those who know how to control and manipulate it, the winds can be very useful in conveying messages across continents. And, depending on the time of year, those loquacious gusts can prove useful to anyone wishing to communicate over a vast stretch of land. Boriahs wrapped his threadbare cloak closer to his body and cursed the relentless breeze. Not only did it bite at his exposed skin and cause his eyes to water, but it also worked to draw information from him. Far to the east, his Master awaited news of his exploits, and he would not be surprised if the wind had already tattled on him. Shaking aside his concerns, he continued his search for a small pool of water that wasn’t frozen over. He longed to be out of these accursed mountains, to be moving east again back to his desolate homeland of Ghorium. But he wasn’t too eager. The biting cold would be worse there, and he had yet to accomplish something to appease his merciless Master. Twice in Oescienne, he had failed to capture the human child, and then once again in Lidien. He had been mere hours from making his most recent move, a strike which would have been successful. Yet, that accursed Tanaan dragon had somehow discovered his plan, fleeing the city with the girl right under his nose. They were still moving, even now as he stumbled around in the forest, heading north toward the realm of the Creecemind. If it were up to him, Boriahs would have gone after them right away. But to change his plans without informing his Master would be suicidal. And it had already been several days since their last conversation. Boriahs cursed, a long, nasty string of barbed words laced with magic. A cluster of small saplings nearby shriveled and turned black, the result of his careless language. The man sneered in perverse satisfaction. He did not like trees, and being in the tree-infested mountains of the west was only turning his mood fouler. But he knew the true reason for his anger and fear: his inability to capture the human child his Master so desired and the repercussions of that failure. Yes, Boriahs was frustrated, but more than that, he was afraid. The Crimson King had been patient for five hundred years, surely he could be patient for a bit longer. Boriahs, however, didn’t want to be the one to test that patience. He kicked aside the ashen ruins of the trees which had played victim to his ire and ascended a few dozen feet more through a thick carpet of pine needle detritus, making it past one last rocky outcropping. He stumbled upon an empty glade a minute later, his heart clenching and giving a relieved flutter in the same beat. Several pools of frozen snowmelt littered the ground like icy mirrors. Boriahs was glad the strenuous hike was over, but he feared what awaited him. Seeking out the largest puddle, he trudged over, the muddy ground pulling at his boots. To his great relief, the pool had only a thin layer of ice covering the top. This is the best you are going to get, he told himself as he picked up a rock and smashed away the film of frost. Cool, black water soaked into his gloves, and once the liquid settled, his reflection stared back at him, glowering. Stark eyes, unkempt hair and a slightly crooked nose suggested a life of hardship, but the most distinguishing, and telling, feature was the scar on one side of his face. Boriahs lifted a hand and brushed at the brand that marked him as the Crimson King’s slave. Years of suppressed memories and suffering rushed forth, almost stealing Boriahs’ breath away. He had joined the king’s army when he was young, his heart torn asunder for the loss of all those he loved. He had willingly given up his mortality and free will for the promise of vengeance. His father had tried resisting the Crimson King when he’d first come to power. A simple tradesman in one of the coastal cities of Ghorium, he had helped lead a rebellion against the Tyrant in the north. But they would never gain their chance to challenge the king of Ghorium. Boriahs’ father and his companions were discovered and brought to ruin. The townsfolk had uncovered the men’s plot and had recognized it for what it was: a risky venture that would only result in angering the Tyrant who ruled over them. Boriahs’ father and his companions were captured and tortured. Every single rebel was killed that terrible day, their dismembered bodies strewn throughout the town, a warning to those who still wished to draw attention to their city by provoking the Tyrant King. To make certain the townspeople never took it upon themselves to revolt again, the families of the usurpers were also dealt with, many burned to death within their own homes. Boriahs managed to escape, but not his mother and sisters. He had been sixteen years of age when he fled, and on the anniversary of the slaughter of his entire family, he’d returned to that sleepy little port with a contingency of the Crimson King’s army and a fresh scar burned into his cheek. He had watched in cold satisfaction as the men who had caused so much harm and pain succumbed to the same fate as his parents and siblings. He had enjoyed seeing their suffering, but when the Crimson King’s men continued to burn and kill and raid their way through the entire town, Boriahs learned the terrible mistake he had made. For one single moment of revenge, he had forfeited his soul, pledging it to a madman controlled by the god of death and chaos. He understood, as he and the army left the ruined city behind to return to their new Master, that his life was bound to that of the king’s. So long as the Tyrant lived, so would he. Taking a deep breath of the biting air, Boriahs tried to clear his thoughts so that he might get through his task. But the past’s dark memories clung tightly to him, their claws buried deep, and by the time he was in control of his own mind once again, the sun had broken free of the horizon. Cursing a second time, Boriahs used his numb fingers to dig out his dagger. He had best hurry. His men would be waking soon, and he needed his next set of orders from his Master. Removing the glove from his left hand proved tricky, but he didn’t even feel the cold steel as he pressed it against his palm. One swift movement reopened the wound that could never quite heal. Fresh blood, dark red and tainted with poisonous magic, welled up. Boriahs released the dagger and used his free hand to pull a cord from around his neck. The pendant hanging from it was the color of yellowed ivory, a bloodrose carved from bone. According to the Crimson King, it was bone taken from the last king of the Tanaan before his people and descendants were transformed into dragons. Boriahs believed it was bone, but he had his doubts about where it had come from. Human, perhaps, or more likely bone from one of the Tanaan dragons his Master had captured and killed over the years. Regardless, Boriahs wrapped his bleeding hand around the talisman and held it over the pool of water. He gripped it tight, forcing the blood to bead and drip from his clenched fist. As the dark droplets met the surface of the water, he muttered ancient words of dark magic under his breath. His concentration was absolute, and soon the dark puddle was swirling and rippling, even though the wind had finally ceased its endless barrage. Boriahs called upon his Master, both in mind and aloud. The undulating water began to churn, then bubble and froth. Putrid smoke rose from its surface and curled over the muddy earth. It was as if Ethoes herself knew who he conjured and fought against his vile presence. Boriahs gritted his teeth and fought the ache in his head. The connection was a distant one, making it all the more difficult. Gradually, the water simmered down and smoothed out, the acrid smoke hissing against the ground. The puddle no longer resembled the muddy water it was composed of, but a window into another land, a cold, dark land. A face appeared out of the gloom, and Boriahs drew in a breath of relief. It was Cierryon, in his human form, not the demon god who controlled him. That meant Ciarrohn was at rest, and perhaps, he would avoid the god’s wrath today. As the magic worked and the picture grew clearer, Boriahs took the time to study his king’s features. Golden brown hair, sprinkled with some gray, covered his head and fell to his shoulders. He looked to be approaching middle age, but the Crimson King’s servant knew better. Cierryon had stopped aging the day he’d struck that terrible bargain with the god of hatred. He had become immortal, a link, a puppet, for the god of death and despair. Without Cierryon’s consent, Ciarrohn would never have been able to consume him, to channel his vast power through the human king’s soul. Because of Cierryon’s greed and ambition, half the world had fallen to the dark god’s malice. The water settled, and Boriahs shook himself free of his treasonous thoughts. If the Crimson King discovered how much his servant despised him, then Boriahs would be dead. Instead, he looked his Master in the eye, eyes that reflected the black pit where his soul used to be, the place where the demon god now lived. “You have news for me, Boriahs,” the Tyrant said, his voice quiet, but resonant nonetheless. It always made Boriahs shiver, for his king’s voice reflected everything he hid within. If anyone were to encounter Cierryon in his human form, they might not be able to discern just what he was if he remained silent. The moment he spoke, or the moment one looked him in the eye, however, would let them know what they dealt with. Boriahs had seen warrior elves and centaurs alike brought to their knees by a mere whisper from his Master’s lips. Boriahs shook his head again and cleared his throat. And without any further delay, Boriahs told King Cierryon everything that had taken place since his last reporting. He told him of his attack and eradication of the dragon Hroombramantu and the interference of the dragon Jaax in the kidnapping of the human girl. He spoke of the corruption within the Coalition and his dealings with the dragon Shiroxx. He told him about the rumor that had been spread about the girl’s questionable heritage and how the same rumor had called the dragon Jaax’s competence into question. And reluctantly, he divulged how the girl and her dragon guardian had, once again, slipped through his fingers. Boriahs finished his tale with his head bowed and his eyes closed, anticipating the blast of angry magic that would most assuredly come. He waited, and waited a few seconds longer, but there was no reaction. When he dared to open his eyes, what he saw terrified him to the point of utter speechlessness. The human face had changed, warping into the skeletal visage of a demon. Burning red eyes regarded him under a forest of wicked, black horns. “You try my patience, slave,” Ciarrohn hissed, this voice deeper, harsher than Cierryon’s. The demon’s ire burned with rage, his slit nostrils flaring as black smoke poured from them. Boriahs felt his bare hands dig into the mud, his fingers curling into fists, trying to grab hold of something to keep from shaking. Frozen air drifted up from the puddle and curled around his body like a giant hand. The icy breath passed through his clothes and seeped into his skin, closing in on his heart. Boriahs gulped for breath and his heart sped up, fear and frost waging war on his senses. Slowly, the ice receded only to be replaced with the prickling pain of warmth returning to his body. “Do not report to me again until you have accomplished something worthy of my attention. That you did away with that bothersome dragon in Oescienne will grant you my peace for only so long, Boriahs,” the dark voice murmured as it faded away, the resonant tones echoing in Boriahs’ mind. Gritting his teeth and taking deep, ragged breaths, the Tyrant’s slave fought against the intense nausea that resulted in these magical exchanges. He fought it, but lost out in the end. On wobbly legs, he stumbled over to a cluster of rocks and retched behind them. Once he was done with the unpleasant episode, Boriahs gathered some of the chilly water into his hands and cleaned his face. It would do him no good to return to his awaiting men looking like a beaten drunkard. By the time he rejoined his small army in the wide meadow they’d camped in the night before, Boriahs was much more presentable. He had managed to scrape most of the mud from his uniform, and even his churning stomach and the pounding in his head had eased. Boriahs hesitated on announcing his return. Instead, he stood behind a screen of fir trees and simply observed the men below. All of them had pledged their souls to Ciarrohn and shared a level of combat skill which elevated them above the thousands of others who had joined under the Crimson King’s banner. But he was their high commander. He held power over all of them. Boriahs almost snorted at the thought. Yes, he may be their superior, but it came at such a high price. Not one of them had any idea what it cost him to speak with their common Master. In fact, he envied them all, going about the morning in such a normal way: starting fires, brewing coffee and tea, cooking porridge and telling bawdy jokes. Some of them tended to the quahna, the fierce beasts they rode instead of horses. With the teeth of carnivores, sharp, cloven hooves and large, powerful bodies, these animals provided transportation as well as an aggressive edge over their equine cousins. It also meant they posed a danger to those who handled them as well. As Boriahs studied the creatures, two pulled free of their handlers and lunged toward one another, screaming their violent rage. The Tyrant’s favored servant wrinkled his nose in disgust. It took ten of his men to pull them apart, and even then, he counted no less than seven of them clutching arms or abdomens where the monsters had managed a bite or a kick. Yes, having such creatures was hazardous, but it also meant no one stood in their way. The small legion had been very successful raiding towns and settlements as they headed north up the coast. Yet, not once did they stumble upon the dragon and the girl, nor find any evidence of their passing. Boriahs curled his lip in irritation. For a year, the human girl and her dragon had hidden behind the magical barrier surrounding the City of Light. Even now, after receiving vital information from that red she-dragon and with the help of his dark mages, he could not find a way into the city. No matter. The dragon and the girl were gone, so it was time for him and his men to move on as well. They would clear out as soon as he gave the order, this time splitting into groups to comb the wilds more thoroughly. No more wandering aimlessly through the endless mountain chains of the west. Not now. The dragon Raejaaxorix and his ward were heading for Nimbronia, and there were only so many roads that led to the great city of the Creecemind. The girl and her companion had a few days head start, but they were traveling on foot and if Boriahs could keep his men moving at a steady pace, then they would catch up to them sooner rather than later. Setting his jaw in determination, the Crimson King’s assassin peeled himself away from the trees and continued down into the clearing. Those who saw him right away stopped what they were doing and offered him a salute. He nodded, but kept walking. When he reached the center of the campground, he climbed atop the trunk of an old fallen tree and raised his arms, his black cloak billowing out behind him. By this time everyone had seen him, their attention now trained on their commander. Silent nods met his words this time. Better. He took one long look at those standing below him before going on. Ten groups of fifteen, plus one commander to keep them in order as well as a dark mage for each faction to take care of that which sixteen ruthless killers couldn’t accomplish. And, he was the Master of them all. Boriahs savored the sense of smug satisfaction unfurling within him, but not for the first time, the feeling was quickly replaced by the sting of his Master’s presence. A reminder to him that he was still a slave. He knew, just as every single one of his men did, that if the dragon and the human should move within the boundaries of Nimbronia, they would be untouchable. The magic that surrounded the city of the Creecemind was even more powerful than the magic guarding Lidien. The men, most of them descended from the mixed races of humans and elves, gave shouts of agreement, all of them thirsty once again for battle and bloodshed. As they scattered about, taking heed of their commander’s words, Boriahs was joined by a waif of a man dressed head to foot in brilliant crimson robes. Like Boriahs, he sported the brand of the Tyrant on one cheek. Unlike Boriahs, he was a wielder of black magic, the sort that required a blood sacrifice. “Armauld,” Boriahs growled under his breath. The mage held up a hand and moved his fingers in a small dance. An orb of white light floated above his fingertips and within its center floated two bright sparks, one green and one blue. “The dragon and the girl,” the mage whispered, indicating the two sparks. Boriahs was about to strike the mage for wasting his time when something odd caught his attention. It wasn’t so much the presence of anything, but the fact that the two sparks came to a standstill, and in the next breath, the blue dot winked out for a split second before flaring back to life again. Then, the two dots began moving once more. “Why did the spark blot out?” the high commander demanded. This time, Boriahs swore loud enough to startle the closest soldiers scurrying around him. He glared at them and barked a reminder that what they didn’t have packed in twenty minutes would be left behind. Grinding his teeth together, Boriahs dismissed Armauld and continued walking briskly to the makeshift stables. His quahna was saddled and waiting for him, the largest of the beasts and as black as soot. The animal, naturally excitable and giving the men holding him as much trouble as a herd of enraged boars, flared its nostrils and calmed upon Boriahs’ approach. Murmuring soothing words, the army’s high commander rubbed the animal’s forehead affectionately. Funny how he had so much trouble connecting with others of his kind, but this vicious beast behaved so well for him. The beast squealed and snorted, slashing its hoof at the ground. Everyone, save for Boriahs, backed away. Taking the reins firmly, the squadron’s leader placed a boot in the stirrup and gracefully mounted the beast, throwing his dark cloak over the quahna’s hindquarters. The animal only protested a bit before Boriahs had him under control. “To your own steeds!” he shouted. Everyone scrambled to follow his orders, and soon, all one hundred and seventy of them were moving, their quahna screaming and snapping their sharp teeth at the excitement of a new hunt. Boriahs waited for all of his men to move out before following after them. Armauld, as well as a few of the other squadron leaders and mages, fell back with him as their sights pointed north. A gust of frigid spring wind curled down the mountainside as they left the meadow in their wake. Boriahs shivered at the cool air moving through his hair and sending his cloak billowing out behind him. But the wind’s icy bite failed to bother him as he led his troops deeper into the mountains, their will set on capturing a Tanaan dragon and the young woman who, with the simple power of her existence, sought to change the world. 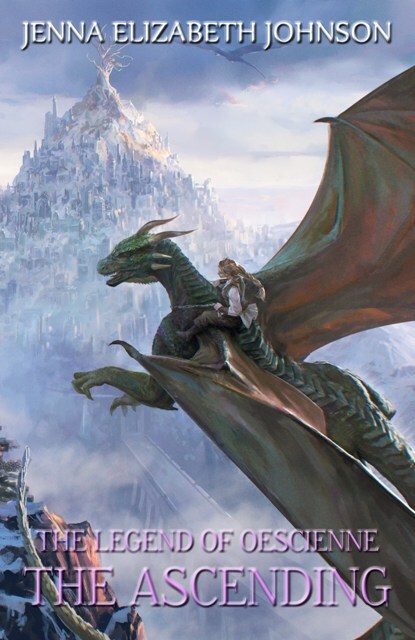 Love the stories about dragons and this cover tells that the story of the book will also be interesting. Will be waiting for the initial release to read it the very first day. awesome blog i ever visit.great the other world series and oescienne series and very impressive books cover art.you seems very talented.keep it up.